1 of 49 · Monks and laypeople sitting amidst stupas at Wat Bo. Monks and laypeople sitting amidst stupas at Wat Bo. 2 of 49 · Monks and laypeople sitting amidst stupas at Wat Bo. Mass graves at the Killing Fields of Choeung Ek. 3 of 49 · Monks and laypeople sitting amidst stupas at Wat Bo. Tourist boats moored on Occheuteal Beach. 4 of 49 · Monks and laypeople sitting amidst stupas at Wat Bo. 5 of 49 · Monks and laypeople sitting amidst stupas at Wat Bo. Western end of Occheuteal Beach. 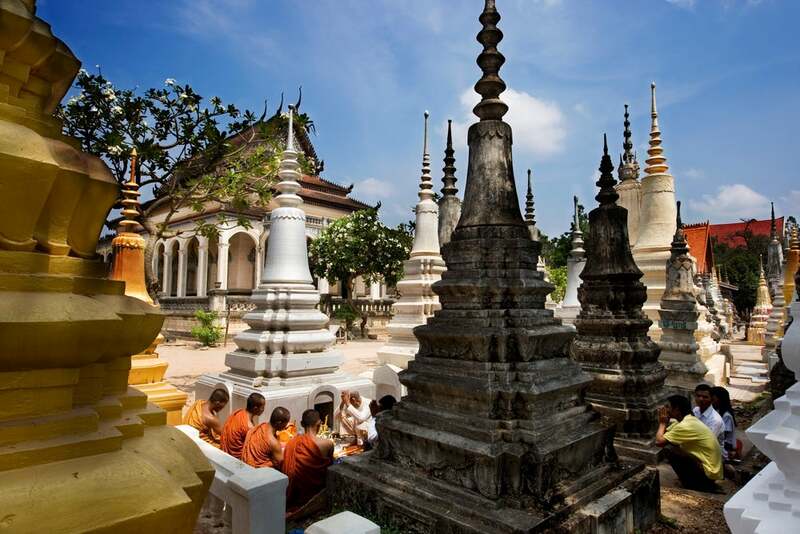 6 of 49 · Monks and laypeople sitting amidst stupas at Wat Bo. Prisoner cell at Tuol Sleng Museum. 7 of 49 · Monks and laypeople sitting amidst stupas at Wat Bo. 8 of 49 · Monks and laypeople sitting amidst stupas at Wat Bo. 9 of 49 · Monks and laypeople sitting amidst stupas at Wat Bo. 10 of 49 · Monks and laypeople sitting amidst stupas at Wat Bo. Foreign Correspondents Club in Angkor. 11 of 49 · Monks and laypeople sitting amidst stupas at Wat Bo. Human remains displayed at the Killing Fields of Choeung Ek. 12 of 49 · Monks and laypeople sitting amidst stupas at Wat Bo. 13 of 49 · Monks and laypeople sitting amidst stupas at Wat Bo. 14 of 49 · Monks and laypeople sitting amidst stupas at Wat Bo. 15 of 49 · Monks and laypeople sitting amidst stupas at Wat Bo. Prasat Thom temple at Koh Ker. 16 of 49 · Monks and laypeople sitting amidst stupas at Wat Bo. 17 of 49 · Monks and laypeople sitting amidst stupas at Wat Bo. Restaurants and beach chairs lining Occheuteal Beach. 18 of 49 · Monks and laypeople sitting amidst stupas at Wat Bo. 19 of 49 · Monks and laypeople sitting amidst stupas at Wat Bo. Russian Market in Phnom Penh. 20 of 49 · Monks and laypeople sitting amidst stupas at Wat Bo. Independence Monument in Phnom Penh. 21 of 49 · Monks and laypeople sitting amidst stupas at Wat Bo. 22 of 49 · Monks and laypeople sitting amidst stupas at Wat Bo. 23 of 49 · Monks and laypeople sitting amidst stupas at Wat Bo. 24 of 49 · Monks and laypeople sitting amidst stupas at Wat Bo. Details of the memorial at the Killing Fields of Choeung Ek. 25 of 49 · Monks and laypeople sitting amidst stupas at Wat Bo. Relief sculpture in Angkor Wat. 26 of 49 · Monks and laypeople sitting amidst stupas at Wat Bo. 27 of 49 · Monks and laypeople sitting amidst stupas at Wat Bo. The National Museum of Cambodia's courtyard. 28 of 49 · Monks and laypeople sitting amidst stupas at Wat Bo. Small jail cells at Tuol Sleng Museum. 29 of 49 · Monks and laypeople sitting amidst stupas at Wat Bo. 30 of 49 · Monks and laypeople sitting amidst stupas at Wat Bo. 31 of 49 · Monks and laypeople sitting amidst stupas at Wat Bo. Kbal Spean in the River of a Thousand Lingas. 32 of 49 · Monks and laypeople sitting amidst stupas at Wat Bo. 33 of 49 · Monks and laypeople sitting amidst stupas at Wat Bo. 34 of 49 · Monks and laypeople sitting amidst stupas at Wat Bo. 35 of 49 · Monks and laypeople sitting amidst stupas at Wat Bo. 36 of 49 · Monks and laypeople sitting amidst stupas at Wat Bo. 37 of 49 · Monks and laypeople sitting amidst stupas at Wat Bo. Rack of leg shackles and busts of Pol Pot at Tuol Sleng Museum. 38 of 49 · Monks and laypeople sitting amidst stupas at Wat Bo. Exterior of Tuol Sleng Museum. 39 of 49 · Monks and laypeople sitting amidst stupas at Wat Bo. 40 of 49 · Monks and laypeople sitting amidst stupas at Wat Bo. Old French Embassy in Phnom Penh. 41 of 49 · Monks and laypeople sitting amidst stupas at Wat Bo. 42 of 49 · Monks and laypeople sitting amidst stupas at Wat Bo. National Museum of Cambodia's entrance. 43 of 49 · Monks and laypeople sitting amidst stupas at Wat Bo. Memorial at the Killing Fields of Choeung Ek. 44 of 49 · Monks and laypeople sitting amidst stupas at Wat Bo. Angkor Wat's Banteay Srei Temple ruins. 45 of 49 · Monks and laypeople sitting amidst stupas at Wat Bo. Angkor Wat's Ta Prohm Temple. 46 of 49 · Monks and laypeople sitting amidst stupas at Wat Bo. Buddha statue at Wat Phnom. 47 of 49 · Monks and laypeople sitting amidst stupas at Wat Bo. 48 of 49 · Monks and laypeople sitting amidst stupas at Wat Bo. 49 of 49 · Monks and laypeople sitting amidst stupas at Wat Bo. 4 Rivers Floating Lodge, Tatala.